↑ 2.0 2.1 Yule Isle and Cocos (Keeling) Islands are Australian external territories in the Indian Ocean southwest of Indonesia and are also commonly considered as part of Southeast Asia. 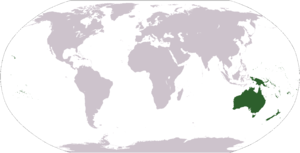 ↑ Novi Selande is often considered part of Polynesia rather than Australasia. ↑ Excludes Timor-Leste and parts of Indonesia, island territories in Southeastern Asia (UN region) frequently reckoned in this region. Disi pagine blid lastim modifika: 19:35 ye 2 julie 2013.